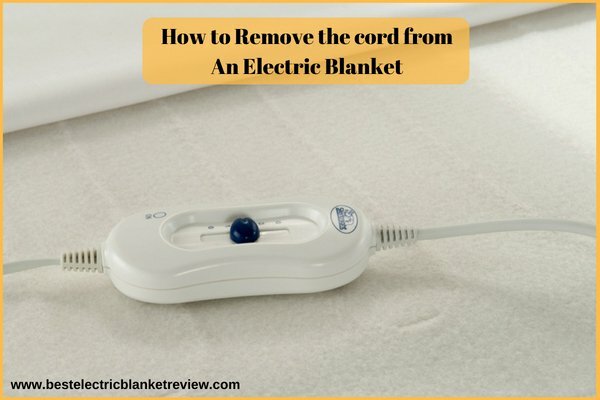 How to remove the cord from an electric blanket: How Can You Do It? When you invest in a lot of time, efforts and money into purchasing a home item that’ll work for about 8 to 10 years, the product surely becomes a favourite one. Electric blankets are one such item that’s a great way of keeping you warm on those winter nights and help you snuggle with your loved one, kids or pets without any hassle. But, after experiencing such a great comfort, you don’t really feel like throwing away the blanket when it stops working. So, what can be done? Remove the electrical component and easily earn back the investment. How to remove the cord from an electric blanket? Start by plugging off the electric blanket before you cut off the wires. Even after you take off the power cord, allow the current to release for the next half an hour. Once the blanket is all settled you can start with the process. This step ensures that you face no injuries due to electrocution. Now that you are all set, lay the blanket flat on the bed. Identify where the wiring cage is situated. Wires are normally visible so you need to figure out where they start from and where they end. Yes, cut a small hole in the area where the electrical wires start i.e. the entry point. Reach into the blanket from this hole and cut off the main cord. Once you have this hole cut out, tightly clutch on to whichever wire comes into your grip. Start to pull this out slowly. And, gradually keep pulling the wires out from the blanket. Till the time wires are coming out freely, keep pulling them. Once you feel something’s stuck and it refuses to easily pull out, cut from that particular point and start to pull out a fresh set of wire. You need to remove as much as you can. If you feel this particular hole isn’t enough, sew it from here and cut out another one from some other area. Smoothen the electric blanket, spread it on the floor if you want and inspect further. By now, you must have pulled out the electrical component, but if you still want to make sure, this step will help you further. Repeat finding wires by spreading the blanket on a flat surface and keep cutting holes so as to thoroughly check for the wires. Now that you have completely emptied the wire cage, you can throw it away and use the soft fabric the way you want! The process is very simple. And, you can actually use the leftovers in some other way and save whatever’s left after the electric blanket stops working. You can either make use of the fabric or simply apply the leftover wires into fixing some connections. If you have any more idea’s then let us know. We’d love to hear from you!